Final Exam is a new feature that was quietly released a few weeks ago. In addition to adding quizzes throughout the course, you can now also set up a final exam built from questions in the various quizzes. Right from the moment Guru was released, almost a year ago, people have been asking us for a feature that would allow them to release their lessons gradually — once a day or once a week or once a month. Today, we released a new version of Guru that allows you to do just that. Not only can you stop students jumping around on the course, you can now use your course as a marketing machine. Send students an email each time a lesson is ready and you’ll bring them back to your site automatically. They’ll stay on your course and renew their subscription to gain access to the remaining lessons. You’ll get more money in your pocket. Now you can export the quizzes results to a PDF document or to CVS format. On quiz manager now you can see a new button "clear results". You can clear the results of each quiz by clicking on this button. A couple of months ago we released a new version of Guru that included the ability to track student participation and follow quiz results. Since then, we've been working on enhancing the quizzes feature to provide greater control and even more flexibility. Restrictions on lessons and courses based on quiz results. 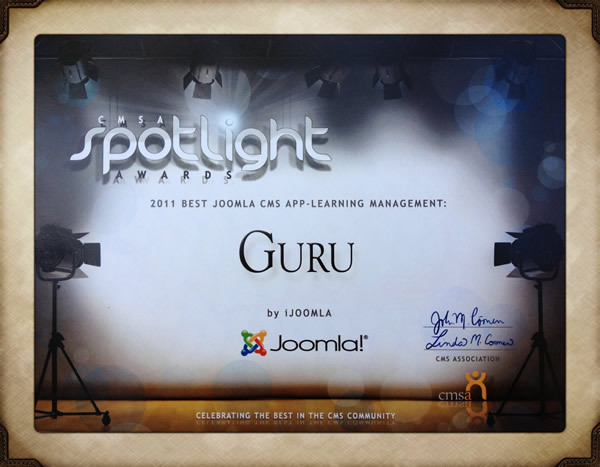 Guru wins “Best Joomla LMS” at CMS Expo! CMS Expo got off to a pretty good start. The CMS Awards, in which developers were recognized for outstanding work in a number of different categories, were held on the first day… and Guru, our new learning management system for Joomla, won the an award for Best Joomla LMS! We are super excited because a lot of sweat went into this one, and it’s nice to see your work rewarded. Since Guru’s release nine months ago, we’ve been able to convert it to Joomla 2.5 and to release twelve new versions with lots of new features. 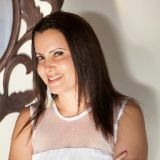 Our goal is to make Guru not only the best LMS for Joomla but also the best LMS of any platform. We think we’re getting there. If you haven’t looked at Guru yet, check out the demo and our live learning center. When we started work on the new version of Guru, version 2.1.0, we asked our customers which new features you’d most like to see. You asked for a student and quiz tracking feature. You’ve got it! Good news! We’ve just released a new version of Guru for Joomla 2.5 with a new feature: Free Courses. Once you've finished creating or editing a course, you can set the price to "free" – and you can even choose who gets to enjoy the gift. That makes free courses a great way to reward current customers and tempt targeted leads. Whatever kind of courses you’re selling, there’s a good chance you’ll need screen capture software. You’ll need to show students what’s on your monitor and which buttons they need to press. My favorite program is Camtasia Studio. Camtasia has the right tools for creating professional screen videos and doesn’t require any complex training. With Camtasia, you can easily generate effective videos that help you train, teach, sell, and more. If you're creating video tutorials with screen capture, there's a good chance you're using Camtasia Studio. In this tutorial I will show you how to mass export your videos into mp4, in high definition. You can choose a lower resolution if your internet connection is not super fast. Once the mp4 files are ready, you can upload them to vimeo.com, youtube.com or your server. I’m a big fan of Vimeo. The site is my favorite choice for video hosting. Today, I will explain how to keep your videos private so that no one can download them or find them on other websites. If they want to see your content, they’ll have to buy your course. It’s an essential step when you’re selling video courses online. If you’re charging for your Guru courses, you won’t want your videos available for free on YouTube or anywhere else on the Web. Nor do you want people to download them… and then upload them to YouTube themselves. Course lessons are always better with videos but where should you host them? On a video hosting site such as YouTube or Vimeo. You have to change two settings in PayPal for Guru to work properly after your customers have made a payment. Thank you for singing up to be a beta tester for Guru! We’re super-excited about this extension because we’ve been working on Guru on and off for three years! We really wanted to create a training system that’s both powerful and user-friendly. It hasn't been easy but I think we did it!